They had both produced nearly perfect seasons, each winning their respective divisions with a 17-1 record. But only one could leave the court Saturday with the added distinction of being named Rhode Island Interscholastic Division II state champion. Led by a 22-point effort from tournament MVP Michael Palumbo, the II-North champions successfully defended their title, defeating II-South champion Narragansett, 69-49, in the Division II final of the Credit Union Basketball Championships, yesterday at the Ryan Center. "This is what I’ve looked forward to all my life," said Palumbo, a junior. "And then doing it, it’s just crazy. Unbelievable." "Winning back to back -- the second year is unbelievable," agreed Purple coach Todd Keefe. "It’s certainly harder the second year, but it never gets tiring, I can tell you that." Even though Classical was beating teams by 20 points or more on a regular basis, there was a point late in the season, admits Keefe, when he wasn’t quite sure another title was in the cards for his team. "I felt like the kids started taking things for granted," he said. "Then we walked into Shea and they knocked us off, and I told them, 'If you guys really want to get through, you’re going to have to buckle down.' "
Buckle down they did. That loss to Shea would be Classical's last, and Saturday the Purple put the finishing touches on yet another championship season. After trading the lead with Narragansett about a half-dozen times over the first several minutes, Classical took the lead for good, thanks to a driving layup by Palumbo with 9:03 remaining in the first half. Although the Mariners would threaten to overtake the Purple a few times, the junior guard helped make sure they did not succeed, picking up 17 more points in the second half, including a run of eight at the start of the period. "Coach just told us to keep doing what we were doing in the second half," Palumbo said. 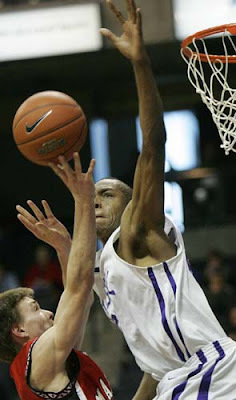 "Then I hit a couple three’s, Ashton (Watkins) started getting to the basket, Lavon (Waite started making some baskets). Everyone just started doing everything a little bit better." "During the course of the playoffs, (Palumbo) started to play better and better, and he shot the ball extremely well in practice," Keefe said. "We knew they were going to double down on Ashton . . . and we needed somebody else to step up. (Palumbo’s) small in stature, but he turns the corner and gets to the basket. He just makes us a much better team." Even with the added attention from Narragansett’s defense, Watkins had a nice day for himself, as well, as the 6-foot-5 center finished with 13 points and 17 rebounds, surpassing the 1,000 career mark in both categories. Junior Jordan Jones contributed 15 points for the Purple, and Waite, Classical’s other senior co-captain, chipped in with 11. Senior forward Nate Patterson – the Credit Union Player of the Game for Narragansett – finished with 12 points and 6 rebounds for the Mariners. Senior guard Jay Jeannotte netted a team-high 17 points and Brendan Kenny had 12.